Reading Worn out Tire Treads can be critical to your safety while driving your car. A worn out tire can blow at any time, especially at high speeds. The tire will heat up causing the pressure to increase and pop goes the tire. A flat tire at high speeds can be quite dangerous and cause loss of control. If it leads to an accident, your life may be in danger. Take a look at all of your tires and take the appropriate action as needed before you have a catastrophic accident. Each check may cost some money but your tires will last longer and you just may avoid an accident. Here are a few of the items that you should consider when reading worn out tire treads. Alignment – if your tire is wearing on one side or the other it usually means that your alignment is out and needs to be adjusted. 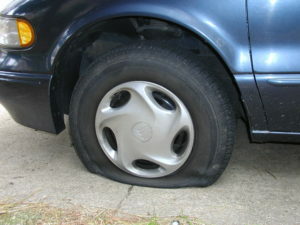 Over inflation – is indicated if the tire is wearing in the middle of the tire. Check your tires for over inflation especially during hot weather. High speed travel also heats up your tires and can lead to over inflation. Under Inflation – causes the tire to wear on both sides of the tire. Check your tires every week to ensure that they are not too low in cold weather. Tires lose pressure in cold weather. Chopped or uneven wear – may indicate that your suspension needs to be adjusted or even have the shocks replaced. Poor shocks will allow the car to bounce and also the tire. Accelerating the wearing out of your tires and initiating possible blowouts on the road. Increasing the potential for an accident when your tire blows out at high speed. There are a number of variables to keep an eye on. If you use a to do list, add these items to your list to check on a regular basis and make some decisions about what you need to do relative to your tire maintenance. 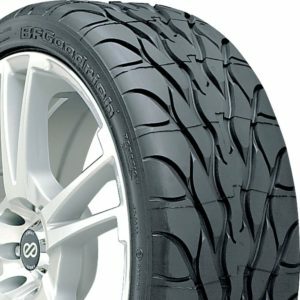 Car tire Aging: Whether you use the car or you don’t, car tires age, primary indications of car tire aging would be cracking on the side walls, on the treads or fading of the treads, sometimes accompanied by tire wall distortion. Old or aged tires must be checked by a tire expert before use to ascertain it’s suitability for road usage. Not only can your tires be dangerous because of age if you keep them a long time on your car due to the low mileage you drive every year, your tires might have been old before you bought them. Always ask the mechanic how old the tires are before they are installed new. There is an indicator on the side wall that will tell you when the tire was made. Anything over seven years should not be installed on your car. Depending on the quality of the tire, they can be good for 20 thousand miles all the way up to 100 thousand miles. You should keep track of how many miles are on your tires and how well the tread on your car is doing. If it gets low, change the tires, if you reach the recommended miles, change your tires. Your tires wear out depending on the number of miles driven, the type of the surface and sometimes even the kind of driving you do. Poor maintenance such as failure to rotate and poor inflation, off balance and poor alignment can accelerate the wearing out of a tire. Tire Maintenance means checking your tires on a regular basis. Tires are the only point of contact between the vehicle and the road surface, hence inflation pressure of your tire happens to play a vital role in safety driving characteristics, mileage and also fuel consumption. Car manufacturers have tested your recommended tires for your car for gas mileage, handling and many more factors to arrive at the optimum pressure for your tires. Following this guideline will maximize the value you get out of these tires and also the safety of your car. This is the most basic of tire maintenance steps you can take. Misalignment: Tires when not positioned properly, or if not aligned properly, can cause uneven wear either sides of the tire shoulder or both the sides and would have a slightly torn and faded look. Check periodically or at least once a month for wheel alignment, wheel balancing issues by examining the tread patterns on your tires. Any abnormal wear is an indicator of a problem which should be addressed. Critical Tire Maintenance keeps Your Car Rolling Smoothly with no delays. It saves you thousands of dollars in gasoline costs over the life of your tires. Did you know that if Americans simply maintained the proper tire pressure in their tires, they would save over 4 billion dollars a year. This is significant not to mention the repairs needed on tires that fail prematurely and require replacement. It is also much safer for the driver and passengers to also have properly inflated tires. According to the National Highway Traffic Safety Administration, tire failures or blowouts are believed to contribute to over 400 deaths and 10,000 injuries in the United States every year. We can quote all of the statistics we want, but most people feel that it will never happen to them or it is always the other guy. Why take the chance, why not protect your family? Under-inflation is one of the leading causes of tire failure. This means putting too much air or not enough into the tires and both cases can cause stress and excessive heat to build up, which can lead to overheated tires which may even result in a blowout or a car crash. Combine high speed with an under inflated tire and if you do not crash from a blown tire you probably will crash due to poor control of your car since the tires just cannot respond well enough. Changes in outdoor temperature can actually affect a car as well as the pressure in the tires.In cold weather air condenses and your tires lose pressure. In hot temperatures, air expands increasing the inflation of your tires. Both are lethal combinations and should be monitored closely. Snow birds who drive from the cold north during winter are particularly pron to this problem as they hit warmer climates. The rate at which tires lose air is higher during the warm spring and summer months. A tire will lose approximately one or two pounds of pressure per month on a normal basis. During the warmer months, pressure loss is even greater. Check your tire’s pressure every time you fill up your car’s fuel tank, especially if you go for several weeks between fill ups and at the least checked once every month as well as prior to leaving for a long road trip. Gradually apply the break until you have regained control over the vehicle if you have a blow out while driving. Once you have brought the car under control, slowly guide your car to a safe area as far away from the road as possible. Never apply the brakes until you have control of the car. Checking the air pressure often. With the proper maintenance, a potential problem can be diagnosed before it occurs and will help to ensure you and your family will arrive at your destination safely. More posts about tire maintenance, click here. Purchasing a new set of tires for your car can be expensive so it pays to take care of your tires and not have them prematurely wear down. Adding the cost of the tire replacement, balancing and even possible alignment of the car can add anywhere from $500 to several thousand dollars to your car operating cost. Some low profile tires are very expensive and you should look after them as you would any other investment to avoid expensive tire repairs. The best way to avoid expensive tire repairs is to take preventative steps that will keep your car and tires in the best condition possible. The first thing to do is to follow the maintenance schedule as outlined in your owner’s manual, which among other things will tell you to make sure your tires are adequately inflated. Always be sure that your tires are properly inflated. This is especially important because tires with too little air, or too much, can result in excessive wear and may cause a blow out. It is often recommended that tire pressure be checked during every visit to the gas pump. While this may seem like a lot, you won’t be sorry that you have kept your tires in the best shape possible. For reasons of both safety and the expense of new tires, this exercise is well worth it. It also will recommend that you rotate the tires on a regular basis. This will even out the wear and tear on your tires and avoid having to replace all four tires prematurely. If you notice unusual noises on your car, check with your owner’s manual for information. Quite often, noises are perfectly normal and there is no need for concern. Your owner’s manual will let you know whether or not a visit to the car repair shop is necessary. You can also consult with your service counter technician to determine if these noise are anything to worry about. They might even want to do a test drive to listen for themselves. If you notice that there is a vibration on the steering wheel or to the car in general, your tires could be unbalanced and if left for too long a time may cause uneven wear on the tire. Don’t put this off, have them check the tires immediately. Sometimes a wheel balancing weight will fall off, particularly if you hit a curb or a bump in the road too hard. When it comes time to have any work competed always get an estimate in writing. This includes rotating and balancing tires. A quality repair shop will be able to provide this information and should also be able to assure you that the repairs will not exceed 10% of a specific dollar amount as outlined in the estimate. Comments are welcome on avoiding expensive tire repairs. For more details about tire maintenance, click here. The Automobile Club of Southern California has recently stated that as long as your vehicle has tires that are in good working condition, you would be able to have good fuel economy and extend the life of your vehicle as well. This is in accordance and with regards to the National Tire Safety Week which started just last April 23rd and would be continuing to the end of this week. The tire shown in this picture is definitely not in good working condition. Your Tires Condition counts. The front end needs to be aligned and maybe some tie rods replaced. This tire has severe wear and tear on the left hand side and the car probably pulls badly to the right as you are driving. Never mind about fuel economy, this driver needs to be concerned about the safety of his vehicle. He should be concerned about being able to stop quickly with out causing an accident. The National Tire Safety Week was launched so as to assist drivers in understanding the basic tire care. Aside from this, the fact remains that there is still that need for proper tire maintenance. From research completed, the statistics have shown that around 85 percent of drivers do not actually check their vehicle’s tire pressure properly or even at all. He continue-s, “Under inflated tires can cut fuel economy by up to two percent per pound of pressure below the recommended level. They can cause your tires to run hot and they can prematurely wear out as well. 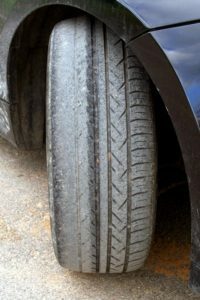 As per statistics that the National Highway Traffic Safety Administration (NHTSA) has, nearly one out of every three vehicles on the roads and highways has a significant under inflated tire. Aside from this fact is that there are some 600 fatalities and around 33,000 injuries that happen every year. These are results of low tire pressure related crashes. It is an easy habit to get into. Before you start the car every morning, take a quick walk around the car. Check the tire pressure by observation, and if a tire looks low, check it with a tire pressure gauge. Once a week use a gauge to check the actual pressure and top up if needed. Never over inflate since the tire pressure will increase as you use the car at high speeds. After you have done this a few times, you will quickly be able to assess whether a tire is low or not. Although we have focused on tire condition and checking the inflation of tires, there are two primary reasons to check your tires. One is to gain better gas mileage. Your car will get the best gas mileage if your tires are properly inflated and balanced. In addition tires that are well maintained have less tendency to have a blow out. If this happens at high speeds, you might lose control of the car causing far more serious consequences. Feel free to leave comments about tire maintenance etc, to help our readers avoid accidents and gain better gas mileage.